Virat Kohli and his men, after winning the historic Test series, went on to clinch the ODI series as well. The 2-1 victory also became the first for the Men in Blue in bilateral ODI series down under. There were several positives from the series for the visitors but none bigger than the contribution of MS Dhoni. There were question marks over his position in the ODI side before the series. He was even criticized for his sluggish knock in the first game in which India ended up losing. But the wicketkeeper-batsman came to the fore in the next 2 ODIs and played pivotal innings that saw the side home on both occasions. Dhoni scored 3 fifties in a row and piled up 193 runs at an average of 193. He was adjudged the Man of the Series as well. The captain Kohli was elated with the performance of the former captain. The 30-year-old was all praises for Dhoni and felt confident that he will continue the good form in the upcoming series. “I think firstly, as a team, we are very happy for MS that he is amongst the runs because it is very important to get runs under your belt to get that rhythm and get that confidence back. Especially when you have not been playing so much international cricket. 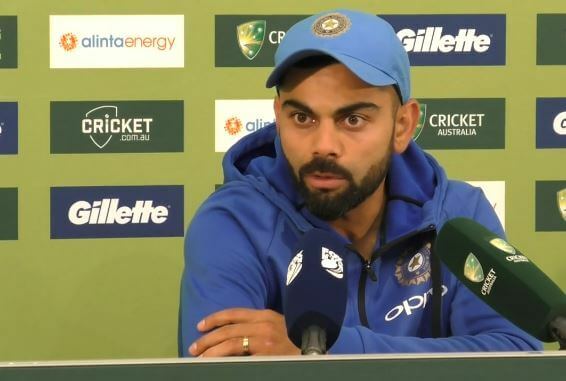 So from that point of view, it is a great thing that he has come here and scored in all three games,” said Kohli in the post-match press conference in Melbourne. “And we feel that he will definitely build on this performance in this series, from here on in New Zealand and back home as well. He will feel pretty confident about his rhythm as a batsman and every batsman needs that whether it’s a domestic or international game, you need runs next your name to gain confidence also. “He is one of the most intelligent cricketers and he is not someone who is not aware about what needs to be done. As a team, we are totally in sync with what he is doing and we are all very happy for him,” added the Indian captain.